Is some Tai Chi better than none? I would like to thank Linda Lou, one of my mentors for this guest post. Linda is the owner of Follow Me Tai Chi. Please check out her website! My answer is a resounding YES! Just because a student doesn’t have the inclination to learn the traditional long forms, should they avoid studying an easier version? I don’t think so. Another one of my very new private students ( just a few lessons into the program) who has fallen several times in the last year, recently went on her first trip to Israel. She had a wonderful time and best of all while walking all over the cities’ uneven and even treacherous streets she did not fall or lose her balance EVEN ONE TIME! This is very gratifying to me as her instructor, and just shows how a small amount of training and some effort on her part to change her bad habit of looking head down when walking, has made an important change in her life. Physically now she is safer, and maybe even equally important, psychologically she has more confidence. 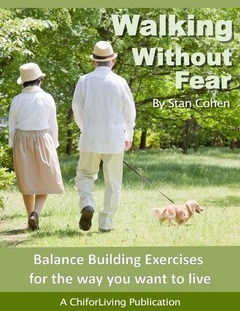 Aside from posture – FEAR of falling is one of the biggest contributors to actually falling down. When one is fearful they tense up, when the muscles are tense the body can’t GROUND to the earth and then the root of your balance is lost. By feeling confident the tension is less and the ability to relax and feel the ground support you, you won’t fall anymore. Practicing a few stepping moves and relaxing as you do so, you will gain the confidence and TRAIN your body with your mind to feel your balance. There are many more advantages to learning Tai Chi forms, but wouldn’t it be amazing if every older adult had the opportunity to learn how to regain their balance just by learning a small tidbit of what Tai Chi has to offer?